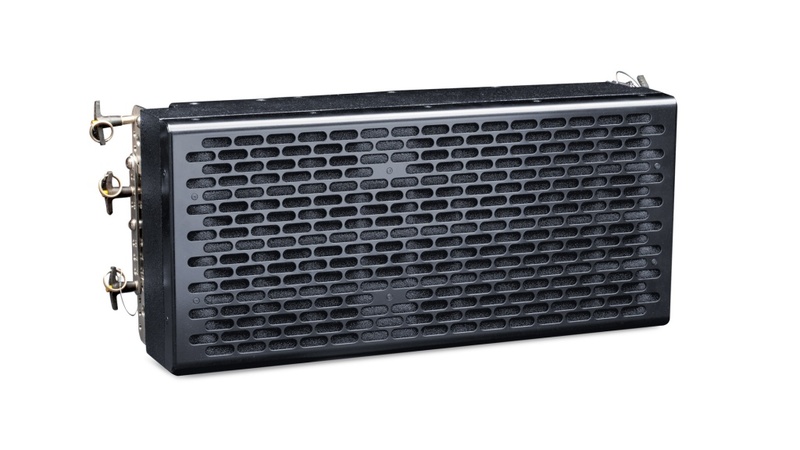 The K-array KH15 is a self-powered, 2-way line array design speaker system. Its ultra-compact aluminum and wood enclosure has an incredible reserve of power that ensures very high sound pressure with wide, consistent (120°) horizontal coverage. The KH15 is best suited for medium throw applications in theatres, concert halls, houses of worship and for corporate AV events. The KH15 low profile box makes it ideal for concert front fill and delay position applications. It easily integrates with other K-array products such as the KH4 and KS4 large format line array elements as a curvilinear down fill array. Bass response and output capability can be extended with the incorporation of the KL12ma or KL18ma powered bass cabinets. The KH15 uses two 8-inch cone drivers with 3” voice coils for low- mid frequencies, powered by two power amplifier channels. The mid-high frequency section uses two 1.75” voice coil compression drivers on 1”x4” constant directivity waveguides. The drivers are integrated in the box with a fixed vertical angle of 15°. The flying points provide different degrees to allow installation in curvilinear line arrays. An internal DSP module provides control presets. Dedicated remote control software allows for control of the speaker from a PC. All the KH15 components are designed by the K-array R&D department and custom made under the K-array quality control system.